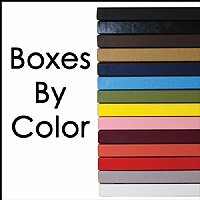 Wildcat Photo Packaging manufactures our own environmentally friendly boxes in a variety of vibrant colors right here in Avon, Ohio. Made in the U.S.A.! We've also created a proprietary printing technology that allows us to supply full color images on all of our colorful boxes. With a wide variety of colors to choose from, the ability to print in full color, and matching and complimentary accessories, Wildcat can help you project your brand and separate you from the competition. Browse these categories under "Photo Boxes by Color"